I can’t stand working in my hotel room. Instead I hang out at cafes and coffee shops around town. 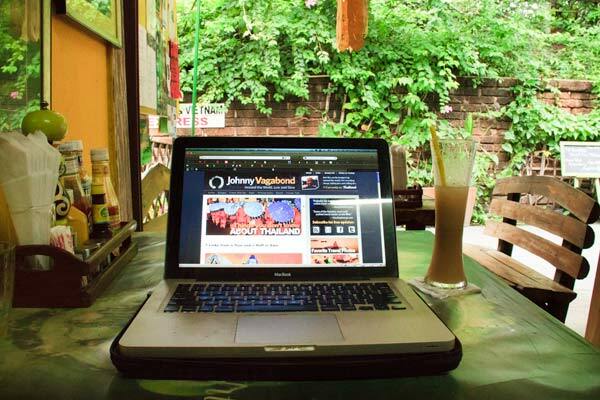 The ideal office has wifi, accessible power, preferably a shady outdoor table, a breeze or fan and a wait staff that doesn’t mind me hanging out for hours drinking coffee and fruit smoothies. It’s a tricky combination. 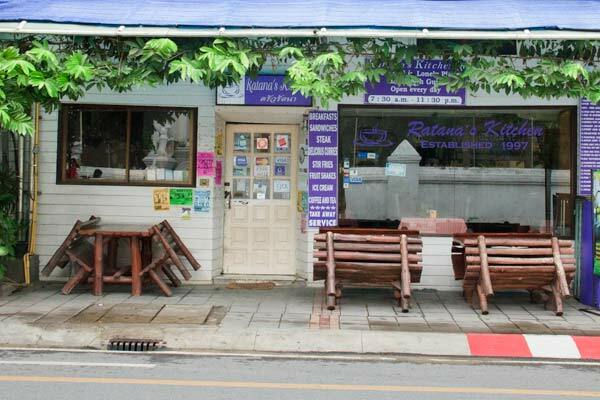 I headed out today at 7:30, planning on stopping at my usual early-morning spot, Ratana’s Kitchen. It’s just around the corner from my hotel and I like to sit outside in the morning and start my day. Today they weren’t open yet and the waiter was standing outside watering the plants. I thought I’d kill a few moments and walked down to the 7-11 to buy an energy drink and peruse the huge assortment of odd things for sale in the coolers (Essence of Chicken? Why?). Ten minutes later, I checked back at Ratana’s and the waiter was still standing unmoving in the same place, watering the same plant. A bit concerned, I checked his pulse — it was weak but steady, so I left him to his duties and headed to my back-up office. 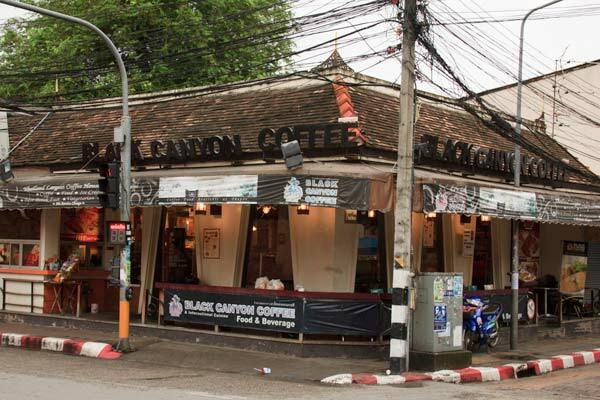 The backup in this case is Black Canyon Coffee, just inside Tha Phae Gate in the old city. It’s a tourist trap and pricey, but they have decent wifi and it’s a great place to people watch. But Black Canyon has a fatal flaw: they tend to play the same CD over and over for days at a time. Recently it was, inexplicably, John Denver and yesterday it was a collection of rock songs sung in a crooning lounge style interspersed with Whitney Houston hits. Girding myself, I opened the door to the fading strains of I Will Always Love You which not only made me cringe but triggered a memory of a small cafe I’d spotted a few days before, tucked down a quiet soi off the main road. Maybe they were open? And they were! The Peppermint Coffee House turned out to be exactly what I wanted: they open at 7am, have great food and fair prices, fast wifi and friendly service. They even bring you free ice water to drink — unheard of in this town. Check them out next time you’re in town and tell the waiter, Abu, that Johnny sent you. Nice. I’ll have to check it out. My spot is over in the Santitam area near Gad Suan Keaw / Central Mall called ‘ The Puppy House’. Opens early, fast free wifi, A/C, good food, and don’t care how long you stay. The only downside is it’s closed on Saturdays and closes everyday around 7pm, which is usually when I start to hit my productivity stride. bummer. 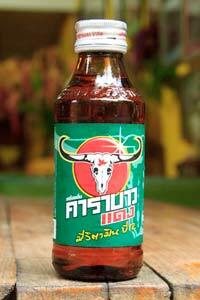 Peppermint is very high on our list and the first place we ever went to in Chiang Mai. Abu and Tapanee (the Thai lady with a british accent) are sweet and awesome. Shhhhh stop revealing the coolest places! looks like someone needs a mini-mouse! Ooo! I’ll have to come back and try it out :) Looks like the perfect cute and away from all the distractions type of place! Can’t argue with the scenery! Looks much better than a hotel room! I am living in CM. Lemme know if you’re up for a beer some day after the “Buddha days”. I would love to hear your stories. My treat. Cheers. What a useful post for the many expats setting up shop in Chang Mai! ha! John Denver…we met up with a man in Pindaya Myanmar who invited us to his house to sing karaoke one evening. He had many American songs that he loved to sing along with, but had never heard them sung with an “American” accent as all of his discs were from China. He was particularly enthusiastic about my twangy rendition of Country Roads. Man, NOTHING is open in Bangkok before 9 or 10 in the morning, not even the coffee places. That’s just wrong! I’ve been in the Chitlom/Siam area at 8 a.m. or earlier and could only find McDonald’s or Starbucks to go to. Annoying. awesome. it’s always fun discovering the country/town you’re staying in. i like the photos, especially of the essence of chicken. sometimes things just aren’t chickeny enough, you know? I was hoping our guesthouse could be my office, but sadly their wifi is broken. Nice office! Hoping to have an office like that soon too, still stuck in corporate America but it’s a work in process. Do you like Chiang Mai better than Bangkok? I love Chiang Mai — it’s very relaxed and comfortable. I like Bangkok, but after 4-5 days I’m usually ready to move on. Awwww, thanks for passing that on. I miss them — really sweet people. Hey, sure, my pleasure! Btw, I’m back in Varanasi now- got any tips on good offices here?? Thanks! Thanks for sharing this Johnny – will check out Peppermint coffee shop this week. I found this post fantastic. I can relate to it very well. We are in Chiang Mai now. Have been here for a month. Prior to this visit, we lived here for 8 months a few years back. A decent office can be hard to come by. I know of all the places you mention. Would also like to add: Happy Hut out on Nimmen, Chocolate Fact at the southern end of Nimmen Soi 7 i think. And there is another place just near Happy Hut (name escapes me) that has an outdoor area and is open from 8am daily. Pretty good wifi in all the places. Not sure where we will be going tomorrow… thanks for the post!